How to numb skin before injection: Is this a possibility for IV starts in hospitals? Do you find yourself dreading the thought of going to a medical facility? Of course, every time you go, you get the one nurse that has to stick you at least 3 times before successfully inserting the IV and the pain is almost unbearable. You are not alone! Almost 200 million IV catheters are started in hospitals in the United States every year⁶. This procedure effects millions and the pain caused by these needle sticks is sometimes not addressed at all. Gradually, hospitals have introduced pain management protocols to include reducing pain for IV starts. What options are out there to address this problem? Next time you visit your medical facility ask them what their protocol is on how to numb skin before injection. Topical Anesthetic for IV insertion is being widely used in hospitals across the country. There are many types of topical anesthetic for IV insertion which include products such as EMLA®, L.M.X.4®, Pain Ease®, and Buzzy®. Buzzy is used to numb an area prior to injection using cold temperatures and vibration in packaging geared toward both children and adults. EMLA and L.M.X.4 are used as numbing cream for IV insertion¹. Paine Ease is used as a numbing spray for IV starts. Each product has pros and cons for use in a hospital setting. A similar option to topical anesthetic for IV insertion is the J-Tip jet injector. It is FDA cleared to administer lidocaine under the skin (subcutaneous tissue) without the use of a needle. It creates a numbing sensation within 1-2 minutes and lasts 15-20 minutes. The J-Tip uses compressed CO2 gas to propel the medication in seconds providing an easy way to relieve a patient’s pain before starting an IV. 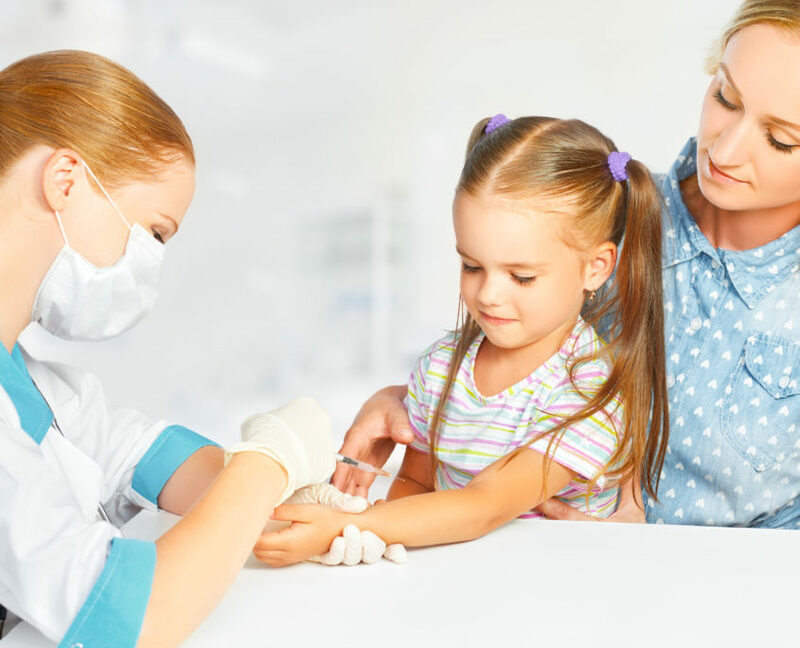 There are two types of numbing cream for IV insertion (EMLA and L.M.X.4) which are typically used in a hospital for children. Both creams are applied to the skin and left puddled on top of the skin for elongated periods of time to achieve a numbing effect. L.M.X.4 cream is applied to the skin prior to the IV insertion and starts to work in about 30 minutes and its anesthetic effect lasts about 60 minutes². EMLA cream is also applied to the skin prior to IV insertion and begins numbing at the site within 15 minutes³. After application it does take a minimum of 60 minutes to provide proper pain relief to patients. In some facilities physicians prescribe Synera, which is a topical patch applied to the skin 20-30 minutes prior to needle sticks⁷. These options can be a great tool if the clinical staff has time to wait before starting their procedure. However, the J-Tip only takes 1-2 minutes to achieve anesthetic effect and its activation is as simple as 3-2-1. Numbing spray for IV starts is also used in hospital settings to provide an instant anesthetic effect. Gebauer Company has a product on the market called Pain Ease which comes in single use or multiple use spray can that provides instant pain relief and lasts up to 1 minute⁴. This product does have multiple options for use in other medical procedures such as suturing and suture removal, injections, drainage of small abscesses and many more. I do have personal experience using this spray as a medical assistant. I assisted physicians in minor procedures and would use the spray to numb an area for the physician to insert a small needle to inject lidocaine. Many patients complained that the spray did not last long and that they still had pain from the needle penetrating their skin. I say this as my personal experience, other clinical staff could have had different experiences. As I mentioned earlier, the J-Tip is used as to numbing for IV insertion but like the Pain Ease spray, the J-Tip can also be used for multiple procedures. Many facilities have started using the J-Tip to pre-numb an area for lumbar puncture, PICC insertion, small biopsies and intramuscular injections. Setting the patient up for success it key! Distraction methods can also be very helpful when setting up for an IV. Honesty is the best policy! Explain what is going to happen from the pre-numbing injection to the needle stick itself. It is also important to know what the patient is comfortable doing in that situation as to how they sit or where they are looking. I’ve been told by patients that it is helpful to look away when inserting the needle as it can help reduce the pain. Some patients feel more comfortable watching because they feel like they are more prepared for what is about to happen. When dealing with children it is a great idea to include the parent in comforting the child in how they sit as well. At the end of the day it is about the patient. How can we better patient experience and help in anyway we can to reduce pain? Choose what is best for the patient! Put yourself in their shoes. It may seem like a minor procedure to you but to the patient it can be one of the worst experiences of their life.